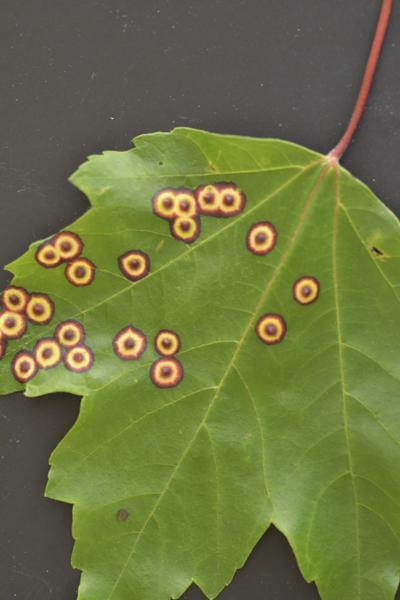 Maple eyespot galls are brightly colored red and yellow spots that appear on the surface of red maple leaves. These colorful spots are caused by the ocellate gall midge, Acericecis ocellaris, in the family Cecidomyiidae. Although rarely seen, adult ocellate gall midges are mosquito-like flies and resemble other midge pests like the boxwood leaf miner. Maple eyespot gall midges occur throughout the range of red maples, which includes the entirety of the Eastern United States and parts of the Central United States. This fly deposits eggs exclusively on the underside of red maple leaves. This causes a chemical response in the leaf resulting in gall formation. This gall is rarely abundant enough to cause injury to the tree but some people find them to be an aesthetic problem. Red maple leaf with several maple eyespot galls. Ocellate gall midges emerge from the soil as an adult in early May and lay eggs in the underside of leaves. The larvae develop within the leaf gall and reach approximately 1.5 mm in length prior to pupation. As a result of hormones the midge injects into the leaf, it develops bright red and yellow rings around the site of larval development. There is a darkened, more elevated point in the center of the ring where the larva resides on the leaf. In 8 to 10 days, the larva will drop from the leaf to the ground where it will pupate in the soil. There is only one generation per year so these pupae will remain in the soil until they emerge as adults the following May. Close-up of maple eyespot gall showing the elevated center. Monitoring includes surveying the tree canopy for leaves exhibiting red and yellow rings on the leaf surface. These galls appear very similar to leaf spot symptoms caused by plant fungal diseases. Hold a suspected leaf gall up to a light source to look for a darkened larval silhouette in the center of the ring. Ocellate gall midges are unlikely to affect tree growth or health and rarely require intervention. Decision making should consider that the larvae within galls are protected from insecticides and that spots will not disappear even if larvae were killed. Proper planting, irrigation, and management of trees will maximize tree vigor. Maple eyespot gall midge rarely become abundant enough to cause damage. Natural enemy populations such as parasitoids and parasitic flies may maintain low population levels. As these gall midges do not typically become severe enough to cause permanent tree damage, chemical control is not recommended. Biology, Injury, and Management of Maple Tree Pests in Nurseries and Urban Landscapes. S. D. Frank et al. 2013. J. Integ. Pest Mngmt. 4(1): 1-14. Common Maple Galls. Townsend, L. 2007 (revised). University of Kentucky Cooperative Extension Service. ENTFACT-404.